For my wife, Brenda and I, the way we started our home-based business was purely by accident. We’ve had a giant rhubarb patch in our yard for as long as we have lived on this property. We barely notice it until fall when we cut down the seed stalks for composting. One spring day Brenda noticed something unusual about that very spot in the yard beside our shed. The rhubarb was gone. Someone had decided to help themselves to whatever was there. Although we never used it, the distressing part was that the rhubarb was basically stolen. The following Spring, May 2014 to be precise, Brenda harvested all the rhubarb before anyone else could. It amounted to a lot of rhubarb. She cut it into shorter stalks and stored them in the freezer. A rhubarb loaf or two were soon produced along with a few other tasty treats such as a crisp and warmed desserts. Then there were more loaves with rhubarb baked inside. This was barely using up the massive crop Brenda had harvested. She soon resorted to recipe books and happened upon a recipe for something called Gingered-Citrus Rhubarb Jam. It was delicious. I encouraged her to try to sell it at a local market. It quickly became a hit. I gave her ‘accidental’ home-based business the name of JamBusters! and before we knew it, sales drained the rhubarb supply. Brenda started collecting it from neighbors who were trying to get rid of it. Eventually, more recipes surfaced and they did not include rhubarb as the main ingredient. 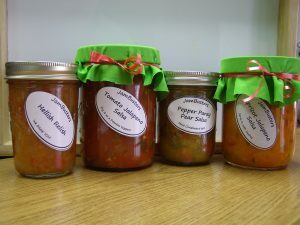 Brenda added more and more products to her inventory with a focus on the mixture of fruit and spicy heat. One that earned awards at a local pepper festival was named Hellish Relish. It contained pears and habanero peppers. Other combinations were added and JamBusters! started to attract local and regional attention. A website and social media feeds kept the product line in people’s faces but what really did it was to be where customers were. We took JamBusters! on the road following a handful of successful vending events we were invited to attend to sell our interesting mixture of jams, jellies, chutneys, relishes and salsas. By the Summer of 2016 JamBusters! 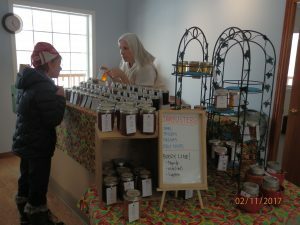 was vending weekly out of town and in the Fall shifted to regular indoor markets throughout the region. Thanks to my career history involving advertising and marketing and Brenda’s featuring customer service, we formed a team that set standards other vendors noticed whenever we were on site at a vending event. Now you can learn our secrets and develop your own successful home-based specialty food business with tips and insight we have gathered over the past two years. I published an eBook in April 2017 titled, “Someone Stole Our Rhubarb: How To Start Your Own Home-Based Specialty Food Business.” In it you will learn how to pick a niche product, how to market it online or in your community plus much more. The eBook also covers a great deal on vending with ideas and suggestions that we have actually tried ourselves. I share with you just the stuff that works and tell you why it works. If you are in the process of looking for a way to earn an extra income with something that is fun to do, and will still give you time for other activities, you need to take a serious look at vending a specialty food product. My eBook sells at Amazon for $2.99 USD and is quite honestly one of the last small business guides you will need. Click here to download your copy today!